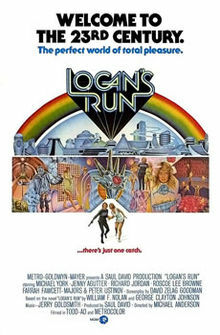 My penchant for dystopias won out over what many would suggest is good sense and I rewatched Logan’s Run for the first time since the 1970s this weekend. Dystopias, of course, are the antonyms to the religio-political utopias that seemed possible to dreamers of the Enlightenment. Since those optimistic times power structures in society have grown ossified and privilege has been entrapped in enclaves of excess wealth, both religious and secular. Seeing the film as a teenager I am certain I missed the savage social commentary in Logan’s Run. Despite its weaknesses, the movie still carries an unexpected punch, given subsequent developments. The premise, for those unfamiliar, is that in the twenty-third century life is ease and hedonism until you reach thirty. To control overpopulation those losing the bloom of youth are euthanized in a religious ceremony to be “renewed.” Logan discovers there is no renewal and, the mythology fractured beyond repair, begins his eponymous run. In a society just beginning to come to the realization that population trends were leading toward the elderly outnumbering the young, film-makers and novelists were trying to predict where human nature might lead. Movies like Soylent Green, Rollerball, and even The Stepford Wives dealt with issues of potential population pressures. One thing they share in common: the prognosis isn’t positive. 1984 came and went, and savvy politicians learned that control may easily be blended with religious sensibilities. Hot-button issues that have little to do with government (defining marriage, deciding which gender has the right of self-determination, declaring biologists in default of creationist fantasies) easily deflect attention from the serious issues of ensuring a healthy economy and providing reasonable care for those who are actually now alive. Spending too much time gazing into the future can be counterproductive. Logan heard rumors of a place called “sanctuary” where the aging are free from the draconian enforcements of society. He takes his lady (dystopias are nothing without a love interest) and flees to discover this idealistic place. There is no sanctuary. Outside the safe, hermetically sealed domes of society is a ruined civilization. It is a world full of possibilities, but practically devoid of people. Finding only one survivor, the only option is to convince the police state he fled that all of this is a lie. Religions too, often rely on offers of sanctuary. Some who believe may find it while others will not. Logan’s Run (now being remade) may not have been the most convincing dystopia, but in bringing ethic and myth together in a world of unheard suffering, it may have read the pulse of society better than several of its more fondly received exemplars.